Exploring the star formation and environmental differences between the LMC and the Milky Way. Determining the effect of low metallicity on stellar winds from non-degenerate pulsar companions. Obtaining a complete sample of binary radio pulsar systems in the LMC. Discovering new members of different neutron star populations in the LMC. Probing the high end of the pulsar luminosity function. Below: Image from Manchester et al. (2006) showing the full survey coverage of the LMC (small red circles). 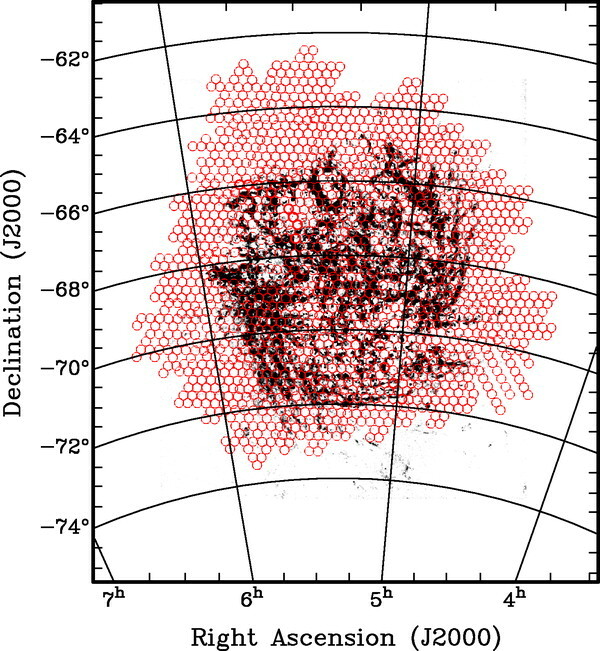 The greyscale is the neutral hydrogen distribution in the LMC from Kim et al. (2003).